Gigabyte X11 to launch 31st of May as "Lightest notebook on Earth"
Interestingly Gigabyte don’t mention Ultrabook here so keep an open mind. 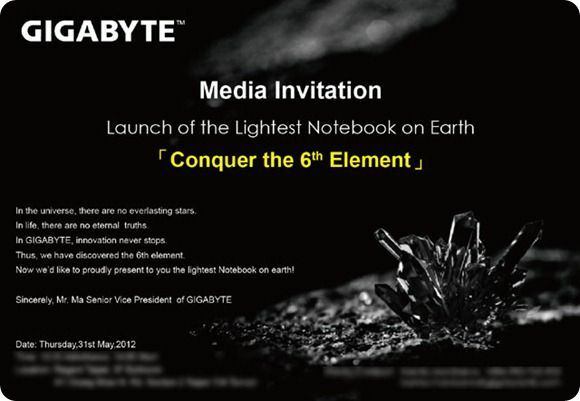 Smartbook or an Atom-based notebook are also within the scope of this invitation but we’ve got a feeling it’s going to be a premium device. Given that Gigabyte have already got the U2442 that we’re expecting to be available soon, maybe they are looking for something to come in above the Ultrabook. Sony and Samsung have the same strategy. What does it take to be the lightest notebook on Earth? To be the lightest notebook on earth…. [checks umpcportal.com database] you need to go some. The lightest Ultrabook we have in the database is the Luvbook X at 980gm. The NEC Lavie Z in 999gm. The lightest notebook we have on our books is an EeePC X101 at 920gm although to be fair, this is very much a low-end netbook. Gigabyte are going to have to go for a 10 or 11.6” display (X11 hints at 11.6) with lots of carbon fibre and a highly integrated motherboard. A smallish battery, 35Wh or less, is to be expected. I’ll be impressed if Gigabyte come up with something special on the 31st because this is a small company we’re talking about. They don’t have the huge resources of a company like Samsung or Apple. My money is actually on a OEM build. Maybe it really is the Luvbook X we’re talking about. The Luvbook X11 is up for pre-order at Dynamism by the way.